Fo-ti also is known as he shou wu (Chinese), flowery knotweed, climbing knotweed, and Chinese cornbind is a climbing plant that’s native to China and is also grown in Taiwan and Japan. 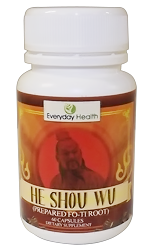 Its a herb whose roots are used in traditional Chinese medicine as a longevity tonic and for conditions, including constipation, acne, athlete’s foot, premature aging, hair health, and erectile dysfunction. Legend has it that famine struck the village of a man named Mr. He. While most people left to find food and temporary work, Mr. He was too sick to leave. He gathered and ate wild plants and roots to keep from starving. One of those was the bitter fo-ti root, which the villagers hadn’t previously eaten. Gradually, Mr. He regained his health. His complexion brightened. He fathered a son. And his graying hair turned black again. Ever since then Fo-Ti has been called He Shou Wu, which translated means "black haired Mr He". 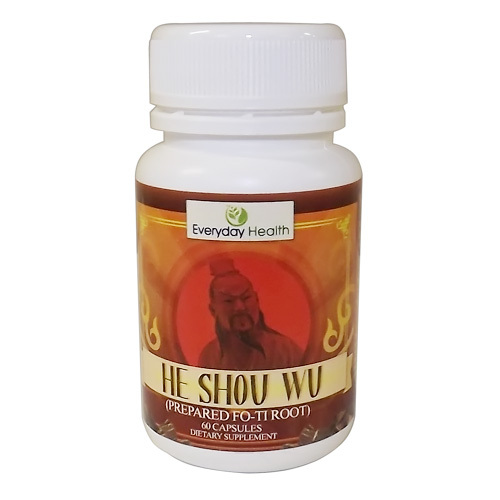 Then there was Chung Yun, a famous Chinese herbalist who reportedly lived to be 256 years old, used Fo ti on a daily basis. This herb is thought to have been responsible for both his long life and his legendary sexual prowess, (he was said to have had 24 wives and over 100 children). Thankfully, these days we have more to go on than just folk legends. Modern research indicates that this herb contains an alkaloid that has rejuvenating effects on the nerves, brain cells and endocrine glands. It stimulates a portion of the adrenal gland and helps to detoxify the body. Hair health, energy and vigor are the products of this rejuvenation. Our Fo-ti has been "prepaired" and then concentrated for maximum potency. The usual dose is 1 capsule, twice per day, on an empty stomach. Each gelatin capsule contains 500mg of Prepared Fo-Ti extract, 10x Strength. It takes 10kg of prepaired Fo-Ti root to make 1kg of our Fo-ti concentrated extract. Prepaired Fo-ti is Fo-ti root, which has been prepaired in a special way, in accordance with ancient Chinese medicine, where the roots are first boiled with soy beans before processing into extract. This process turns the roots a redish colour and activates the additional medicinal properties of the plant, expanding the scope of health benefits. Fo-Ti supports over all well being and general health. Its used as a Longevity product, and also used for premature graying of the hair, nerve damage, wind rash, eczema, sores, carbuncles, goiter, scrofula and inflammation of lymph nodes, heat toxicity, Immune boosting, atherosclerosis, constipation, fatigue, high cholesterol, hair Health, rejuvenation, sexual vigour, detox, Lower cholesterol, hair loss, dizziness, ringing in the ears (tinnitus). sleep problems, and high blood pressure. No. This is a health Supplement and no prescription or doctors visits are needed. However if you are on any medication or have any serious health concerns you should check with your doctor first. This product is not recommended for persons under that age of 18 or pregnant woman, or persons with Liver disease, or have heart problems, or suffer any serious illness. Foti can interact with some medications, If you are taking medication or suffer from any serious illness check with your doctor first. How long untill I get my order?